1. Two in a row for Stew. Where does he go from here? Jason Thomas: Well, I would assume he got on a plane to Florida and will then fly to Atlanta for the race next weekend. All kidding aside, I think the next three weekends will be crucial in this championship. Atlanta and Daytona are two of Stewart’s best racetracks and if he can keep this ball rolling, he may leave Daytona with the red plate. The key for him is taking it week-by-week. But as an observer, it’s fun to look at the big picture and see the repercussions of Villopoto not re-establishing his dominance. Stewart has won this title a time or two and if he keeps gaining confidence, it may be a time or three in May. David Pingree: James Stewart is simply more at home when the series goes east. The soft, tacky soil is just like his track at home and the indoor stadiums mean he no longer has to worry about hard-packed tracks or mud races. There is no question James will win more races this year. The question is: Will he crash out of any? Historically, James removes himself from championship battles with head-ringing crashes that rob him of 25 points at a time. However, Stewart is different this year. He is more methodical and patient, and willing to take a second if that's all he has. He no longer feels like he has to win by huge margins ... just win. That means Villopoto, Roczen, Dungey and the rest have to get very serious about finding the top of the podium if they want to slow down number 7. How will he do in Atlanta? Three in a row wouldn't surprise me. Steve Matthes: Where does he go from here? Well, I think that he should, as soon as this weekend, go to second place in the points at least. We always see the Anaheim 1 contenders get whittled down to a pair of riders, or sometimes just one guy, and things begin to settle into a natural order. Stewart's looking great right now, but to me, Ryan Villopoto still has nothing to worry about. I expect him to assert his speed as soon as this weekend. But Stewart's been great and he'll be RV's number one title threat from here on out. That's my opinion. But remember, I called Barcia to be RV's number one problem this year. So what do I know? 2. Banner night for Pro Circuit, rough one for GEICO. Will this be the case all year? Jason Thomas: I think it may be, yes. Pro Circuit looks to have the edge on the East. They have the most experienced team and looked to have the fastest as well. With Bogle coming off injury, rookie Bisceglia just getting his feet wet and Wharton’s late arrival back on the team, they don’t seem to have the dominant title contender they have had in recent years. David Pingree: Hopefully the GEICO team can get it together and get in the mix as the series moves on. Regardless, this series is going to be dominated by Pro Circuit riders. Adam Cianciarulo is for real, Blake Baggett will be solid and Martin Davalos will get his first win this season. It's mind-boggling that he hasn't won one yet, but he is simply going too fast to NOT get a win. If he can just keep his head screwed on for 15 laps he'll get his first win, maybe as early as this Saturday night. Steve Matthes: It's so nice to see the underdog team finally enjoy some success! No, but seriously, I think it’s going to be a long East Coast series for the GEICO guys. 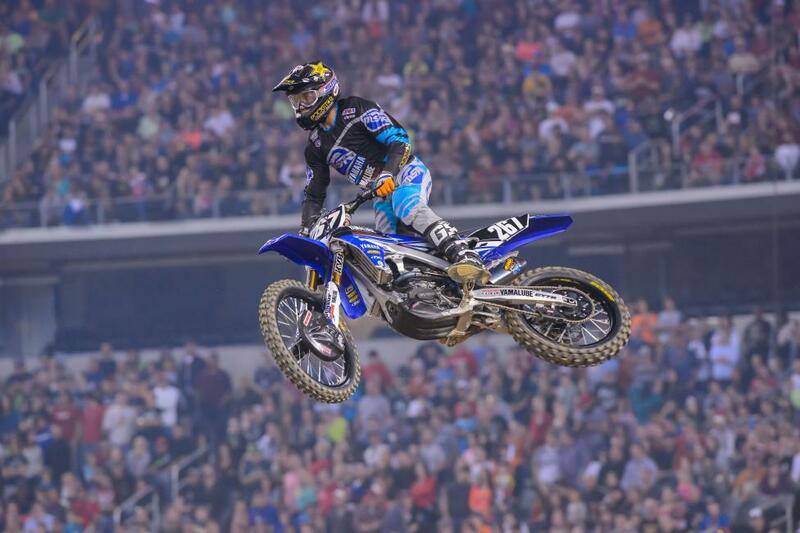 Bogle's probably the best of the three riders week-in and week-out and Wharton could show some flashes here and there but all three PC guys were better than I thought they would be. Every single time out on the track Davalos and Cianciarulo were the two fastest guys and Baggett's just going to get better with more time on the bike. It wouldn't be surprising to see the green guys get one or two more podium sweeps this year. They were that good! 3. A rookie win for Cianciarulo gets the most attention, but rookie Anthony Rodriguez looked good, too. Did anyone see this coming? Jason Thomas: I had heard from a few MTF insiders that A-Rod was looking solid and would turn heads at Dallas. His speed was good all day and night but as rookies tend to do, he made one big mistake and it ruined an otherwise great debut. He had zero hype coming in, but if he continues to ride like he did in Dallas, that will change. David Pingree: I didn't. While Yamalube/Star Yamaha has been grooming Rodriguez he hasn't set the world on fire at any races leading up to the supercross series. He was out injured for a lot of last year’s amateur races. But sometimes flying under the radar can play into a rider’s favor because they don't have any pressure and expectations are low from a spectator's standpoint. If Anthony can consistently ride near the front he could be the surprise of the year. Steve Matthes: No I didn't, but then again, I sometimes find the hype of the amateur scene a little nauseating, so I stay away from closely following it. Wake me when the kid becomes a pro, battles with the best, deals with an injury and doesn't have mom and dad to coddle them. But that's another rant for another day. I thought A-Rod was great (and it's also great to finally have an "A-Rod" in our sport, by the way) and I hope he's okay to race Atlanta. He was much better than the amateur "experts" I had spoken to about him predicted. So no, I didn't see it coming. Then again, I didn't really care to watch him at all as an amateur. Who do you think I am, Wes Williams?